We are the right place for you, if seeking for the Exhaust Fan Filter Units of the superlative quality with the rational price tags. Our name figures amid the top entities engaged in the manufacturing and supplying of the Exhaust Fan Filter Unit in India. Our deft team puts painstaking efforts to construct the Exhaust Fan Filter Units that are flawless in construction & performance. Our Exhaust Fan Filter units are designed to remove micro contaminants generated inside a clean room. 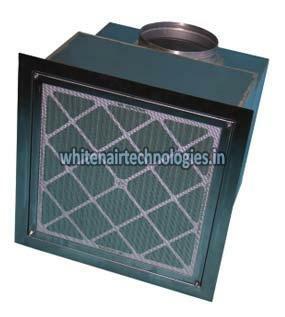 This reverse flow fan filter units are ideal for rooms where powders, aerosols, or fine dust is generated. The Ext HEPA Filter safely removes micro-contaminants down to 0.3 microns from the air exhausted from the clean Room.